Ballet British Columbia, Canada’s leading contemporary dance company, is heading to the UK for their first tour in 2018. Founded in 1986, Ballet British Columbia has been under the artistic directorship of Emily Molnar since 2009. Emily was recently appointed to the Order of Canada for her artistic leadership of the company and its contribution to advancing contemporary dance in Canada. In this podcast interview held at the Canadian Embassy in London, Emily shares her journey from taking over the company at a time when it was nearing bankruptcy, to transforming the company into the leading contemporary dance company in Canada. Emily revolutionised the company from the ground up, starting with the technical capabilities of the dancers, to re-invigorating the repertoire by bringing new choreographers to create new and exciting works on the company. Emily shares how her own successful dancer career – forged with the National Ballet of Canada, Ballet Frankfurt and as a principal with Ballet BC – influenced her approach to rescuing the company that was struggling artistically and financially. The UK tour is part of Emily’s artistic vision for the future of the company, setting it firmly on the international stage. Artists of Ballet BC in Solo Echo. Photo by Wendy D.
Ballet British Columbia and its 18-strong dancer-workforce return to the UK with the same evening of dance that wowed the festival audience in 2016. – Bill by Tel Aviv-based Sharon Eyal. Emily’s 16+ a room is inspired by the work of Virginia Woolf, Jeannette Winterson and Emily Dickinson. 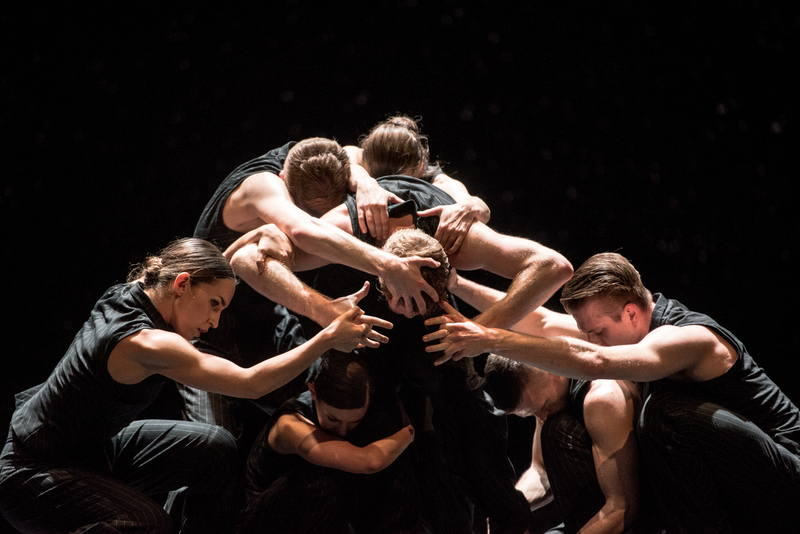 Sparked with explosive, fast-paced choreography that pushes the dancers to their athletic and technical limits, 16+ a room displays Molnar’s unique choreographic language through a complex study of time, transition and stillness. 16+ a room received its world premiere for Ballet British Columbia in October 2013. Music is arranged and composed by Dirk P. Haubrich. Lighting design is by Jordan Tuinman with lighting direction by James Proudfoot and costumes by Kate Burrows. Artists of Ballet BC in 16 + a room. Photo by Michael Slobodian. Vancouver-born Crystal Pite is a former dancer with Ballet British Columbia. Pite made her choreographic debut with the company in 1990 with Between the Bliss and Me. The success of the work allowed Pite to create additional pieces for Ballet British Columbia and since then she has created over 40 works for some of the world’s top dance companies. Inspired by two sonatas for cello and piano by Brahms and the poem ‘Lines for Winter’ by Mark Strand, Pite’s Solo Echo portrays a man coming to terms with himself at the end of his life as the choreographer explores recurring themes of acceptance and loss. Solo Echo received its world premiere in February 2012 (Nederlands Dans Theater) and its Canadian premiere in November 2015 (Ballet British Columbia). Lighting design is by Tom Visser, set design by Jay Gower Taylor and costume designs by Crystal Pite and Joke Visser. Scott Fowler and Artists of Ballet BC in Bill. Photo by Chris Randle. The final piece is Bill by Tel Aviv-based choreographer Sharon Eyal. Dancers showcase their extraordinary skills in synchronised ensemble sections and solos in the work created by Eyal with her long-time collaborators Gai Behar and Ori Lichtik. Bill received its world premiere in May 2010 (Batsheva Dance Company) and its Canadian premiere in May 2016 (Ballet British Columbia). Original music and soundtrack design is by Ori Lichtik, lighting design is by Omer Sheizaf and costume design by Sharon Eyal and Gai Behar. Eyal was born in Jerusalem and has enjoyed a long-standing affiliation with the Batsheva Dance Company. Eyal launched L-E-V with Gai Behar in 2013. Eyal is the Guest Artistic Director for the National Youth Dance Company and her work for the company will premiere at Sadler’s Wells in April 2018. Dancers Scott Fowler, Kirsten Wicklund and Artists of Ballet BC in Bill. Photo by Chris Randle.